Year of Code - PR fiasco or vital mission? It seems like something that everybody would support - a campaign to help transform computing education in our schools. But since its launch last week, the Year Of Code has turned into something of a PR disaster. Its director has admitted she doesn't know how to code, and there's been derision and confusion from some in the IT industry and from many teachers about the mission and its objectives. I've talked to two people with two contrasting views of the Year of Code (full disclosure - the BBC is one of the partners in the Year of Code). Emma Mulqueeny, who's been out there spreading the gospel of coding for years with her Young Rewired State organisation and its Festival Of Code, was invited rather late in the day to get involved in the campaign. She very swiftly decided that it was a bad idea - as she made clear in a delightfully intemperate blogpost titled "7 reasons why the Year of Code is just AM Dram." And when I got in touch with her she hadn't really calmed down. "It doesn't know what it's doing, it's not focused, it hasn't looked at all the research that people have done," she explained. 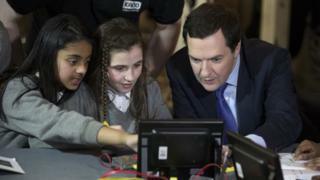 "The thing that really tipped me over the edge was when I found that they hadn't even bothered to contact Computing at Schools, which has spent six years working on this..."
She snorted at the idea that a video of George Osborne on the campaign's website might encourage people to code, and was critical of the decision to make Lottie Dexter - the young PR woman who admitted she had never coded - the spokeswoman for the campaign. Though sympathetic to the situation in which Ms Dexter found herself, Emma Mulqueeny says that "the amount of damage she has done to the cause of programming is frightening". Having campaigned hard for years to get girls to see themselves as coders, her frustration about a woman with no track record in this area floundering on live television was palpable. Much of the direction and the financing of the Year of Code has come from the venture capital firm Index Ventures, where the former Downing Street adviser Rohan Silva is now Entrepreneur in Residence. Mr Silva, who'd been in touch with me before the launch encouraging me to cover it and to interview "the brilliant head of the campaign Lottie Dexter", is the chairman of the Year of Code. But it's Saul Klein, the energetic entrepreneur with a background at companies like Lovefilm and Skype, and now a partner at Index, who seems to be the moving spirit behind this campaign. He has also put money behind Kano, which aims to make the Raspberry Pi easier to use, and the code teaching business Codecademy. And when we talked, he mounted a passionate defence of the Year of Code, while conceding that the campaign had hit some "broken glass" and "speed bumps". Throughout our conversation three figures kept cropping up - 90% of the country didn't know how to code, 70% of adults didn't know that coding would be in the curriculum come September, and 100% of teenagers thought it would be vital for their future job prospects. He defended Lottie Dexter, maintaining that if 90% of people were not coders then using a person without those skills would help raise awareness. "If you're launching a campaign to reach the mainstream, Lottie is a brilliant person." I asked whether this was a government or an Index Partners initiative and came away little the wiser - but Saul Klein was unapologetic: "We live in a world where the intersection of public policy and commerce is often needed to drive an important social agenda." He said that the UK government's policy on coding was being seen as groundbreaking around the world and we ought to celebrate that - but there was now an urgent need to give the teachers the tools they would need by September. "I am totally unapologetic that I'm trying to do something that is good for everyone - and that anyone can be part of it." Now it's fair to point out that some of the criticism is mean spirited. There is a minority of older experienced programmers who see themselves and their craft as an exclusive band of brethren and will always be hostile to an initiative like this. A glance at the comments under a YouTube video of Lottie Dexter's Newsnight interview reveals a murky world of misogyny and coding snobbery. But there is also a lot of goodwill out there, particularly amongst those IT teachers who have been campaigning for years for a more stretching and creative approach to computing education. If the Year of Code can take a breath, sit back and work out what it wants to achieve, then maybe it can regain some of its lost credibility. What would it take, I asked Emma Mulqueeny, to persuade her to come back to the Year of Code? "They need to turn it off, have a long hard look and then turn it on again, then maybe." The trouble is, Saul Klein doesn't think there is time for a reboot. With 30 weeks to go before teachers have to get to grips with the new curriculum, he believes the time to raise awareness about coding is right now.